Kapuria is considered to be one of the most creative contemporary artists, whose concept of art involves diverse domains. The French government awarded him the Chevalier de L’Ordre des Arts et des Lettres, one of the highest honours in the arts. He was also granted the Award of Excellence by the government of Romania, Order of the Crown granted by the government of Belgium, Charles Wallace Trust UK Award and Triennale-India Award. 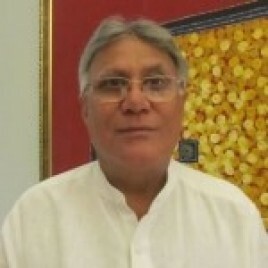 With over 40 years of experience in various media, Kapuria himself gave rise to several festivals in India and abroad. The Conrad Festival featured an opening of his installation entitled Untold Stories at the Jan Siuta Gallery.